Jet is the youngest member of KCSD and is training in airscent. 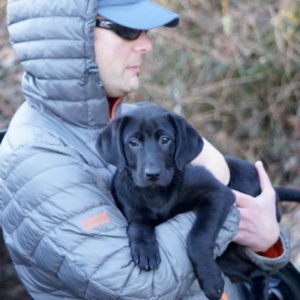 She is a labrador retriever that is already showing great promise chasing stuffed toys through the woods and has melted the hearts of everyone she has met. Mathew has been a member of KCSD since 2011 and a member of KCSD's sister unit ESAR since 2009, where he is a Team Leader and a Rigging Novice. He was one of three KCSD members in 2015 and one of four in 2016 recognized by the King County Council for extensive volunteer hours and contributions to the King County Search and Rescue Association (KCSARA).